Watch The Simpsons Season 2 Episode 18 online via TV Fanatic with over 6 options to watch the The Simpsons S2E18 full episode. Affiliates with free and paid streaming include Amazon, iTunes, Vudu, YouTube Purchase, Google Play, and Simpsons World. 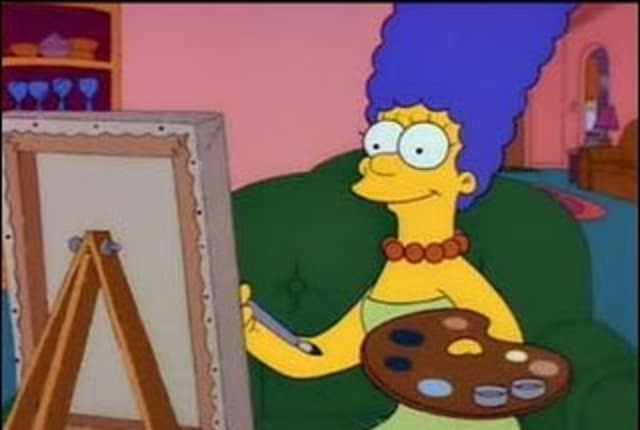 After discovering an old picture she painted of Ringo Starr, Marge takes an art class. Marge is eventually hired to paint Mr. Burns but portrays him as naked and frail. Dear Marge, thanks for the fab painting of yours truly! I hung it on me wall! You're quite an artist. In answer to your question, yes we do have Hamburgers and Fries in England, but we call French Fries "chips"! Love, Ringo. PS. Forgive the lateness of my reply. Homer: I'm a big fat pig! Marge: Now Homer, you do have big bones. Homer: Marge, nobody gains 30 pounds of bone!